To develop iPhone apps, you have to be able to navigate the tricky Xcode Workspace window, and you’ll find a guide here. This cheat sheet also helps you cut through some common confusion over what iPhone view controller method to use. Areas are toggled on and off by using the View selector (outlined in blue in the top right of the figure). 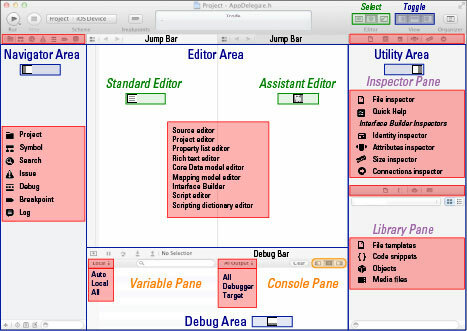 Xcode also has three editor panes: the Standard editor pane, the Assistant editor pane, and a Version editor pane. These are selected in the Editor selector (outlined in green to the left of the View selector). iPhone Application Developers struggle with knowing what view controller methods to use, and when. Picking the wrong method to refresh your user interface can result in an iPhone app that disappoints the users. To understand when to do something in the UIKit framework, you need to know when messages are sent, especially to view controllers. View controllers have a life cycle just as applications do, and certain messages are sent as views that are displayed and hidden. some static text, load that text here. viewWillAppear: When the view is about to become visible Do the things that are necessary to present the view. Dummies, update that information in this method. The viewDidLoad message is sent to the view controller after the view controller has loaded its associated views into memory. This method is used to perform view initialization and is not necessarily called every time the view appears. If, for example, the user makes a selection in the view that causes a new view controller to load and slide its view into place, and the user then taps the Back button, this message is not sent when the originating view reappears. That is the job of viewWillAppear:. The viewWillAppear: message is sent when the view is about to become visible. The first time it is sent is after the viewDidLoad message and then whenever the view reappears, such as when you tap the Back button, for example. You use this method to refresh your user interface, if needed, but not for initialization.